Pioneers in the industry, we offer hdpe twine rope from India. We are a leading company specializing in the business of providing HDPE Twine Rope. To process this rope, our expert workforce uses quality grade PP materials. This rope is used for strapping and binding packaging boxes. The rope is checked on defined quality parameters by the quality analysis to provide the defect free range to clients. 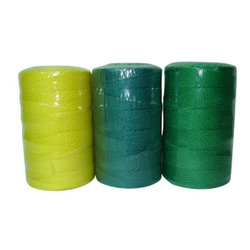 We can customize this HDPE Rope in different colors and thickness as per client's requirements.